Frank Laurent Coffee Roasters has two outlets in Penang: Udini Square and Gurney Plaza. The latter is located at Level 7, right in front of Go Noodle House. As a roastery, Frank Laurent also sources and roasts its own coffee beans. 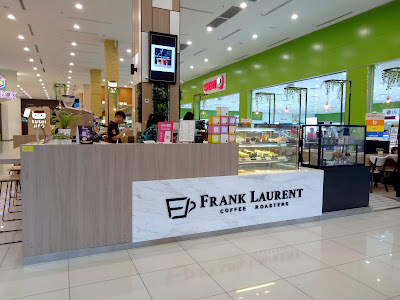 I ordered a cup of Mocha (RM12.00), which is essentially two shots of espresso with steamed milk and chocolate syrup. 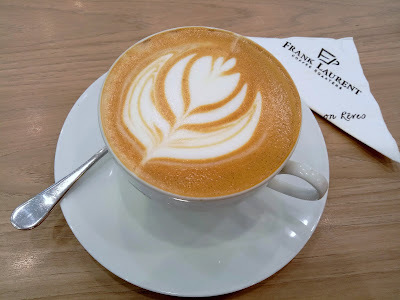 In hindsight, I should have ordered Cappuccino or Caffe Latte instead as the chocolate's sweetness masks the coffee's flavor. 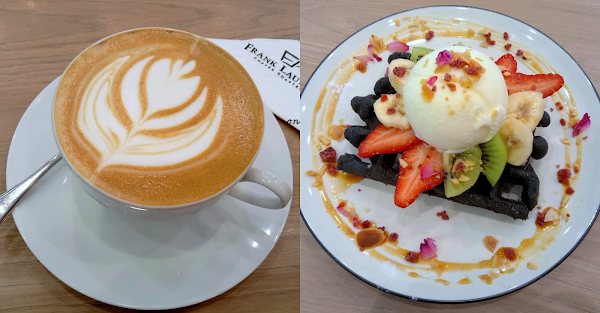 Several types of waffle are available at Frank Laurent. The Caramel Charcoal Waffle (RM19.00) is black in color because it is prepared from batter that contains bamboo charcoal. 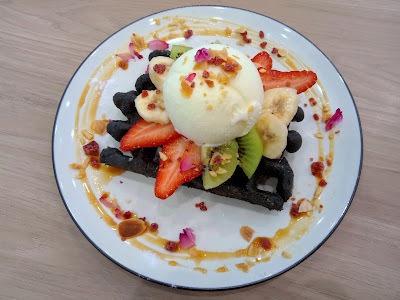 The waffle is topped with vanilla ice cream, strawberries, kiwifruits, bananas, almond flakes and caramel. In my personal opinion, I think the waffle is too dry to be enjoyed properly.